Lausanne, 4th April 2019 – An intense challenge, the one that took place today with departure from Madonna di Campiglio and arrival on the Spinale Mount, after a course of 3500 metres of development and 650 metres of difference in height. 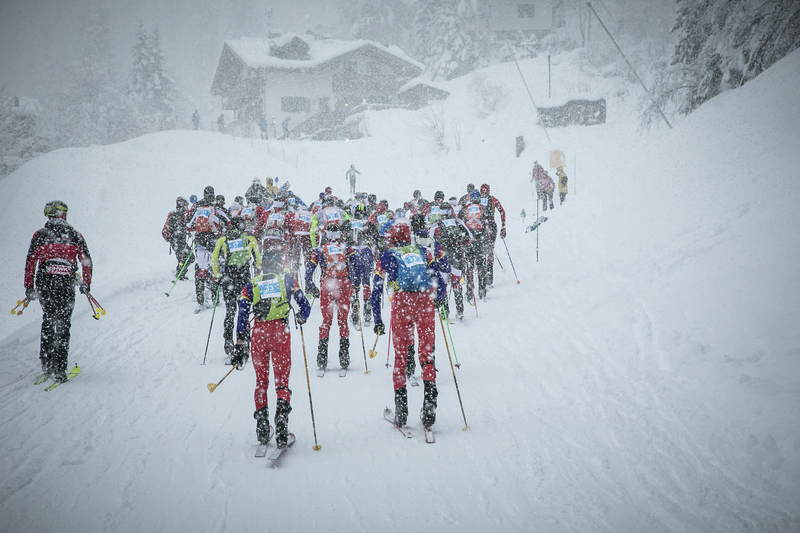 Under a very heavy snowfall and an annoying wind in the last part the first athlete to cross the finish line has been the Swiss Werner Marti. He managed to detach his opponents 200 metres away from the end, by imposing an unsustainable rhythm for them. His final time has been of 24’31”, 13 seconds before the Italian Robert Antonioli, who moved away from his teammates, thus achieving the goal of the day and especially of the season. Still Italy and still the Army Sports Centre got the third place of the podium, thanks to the 29-year-old from Albosaggia Michele Boscacci (winner of the 2018 World Cup Overall), who arrived at the finish line only 6 seconds behind his compatriot. Federico Nicolini (ITA) has arrived fourth, Anton Palzer (GER) fifth and Davide Magnini (ITA) sixth, 40 seconds behind the winner but first in the Espoir category, followed by the athlete coming from Alto Adige (ITA) Alex Oberbacher. Among Espoir Men, as anticipated, the victory has been for the racer of the Army Sports Centre Davide Magnini, who preceded the French leader of the Overall ranking Thibault Anselmet by 20 seconds, chased by Samuel Equy (FRA). Also the Women‘s challenge has been particularly hard-fought and at the end the French favourite Axelle Gachet Mollaret triumphed, predating the Swiss Victoria Kreuzer of 51 seconds. The Venetian Alba De Silvestro (ITA) took the third position, detached from only 1 minute and 43 seconds, then the Slovak Marianna Jagercikova (4° place), the Spanish Marta Garcia Farres (5° place) and the Italian Giulia Murada (6° place). The young competitor of the Army Sports Centre has also been the best among Espoirs, 18 seconds faster than the Swiss Arina Riatsch, who in turn preceded her teammate Alessandra Schmid. Italy also won among Junior Men, thanks to the athlete from the Aosta Valley Sebastien Guichardaz, who kept the lead of the race starting from the beginning, managing to detach his opponents and closing with a time of 26’23”. After him, with a distance of only 10 seconds, the Swiss Aurélien Gay got the second position, while the Austrian Paul Verbnjak has arrived third, 13 seconds later. The Italians Fabien Guichardaz and Daniele Corazza respectively took the fourth and the fifth places. Among Junior Women, there was another seasonal success for the Russian Ekaterina Osichkina, who inflicted a gap of almost 2 minutes to the Swiss Emilie Farquet, followed by the French Malaurie Mattana and the Italians Samantha Bertolina and Valeria Pasquazzo. At the end of the challenge on the Spinale Mount the final ranking of the Vertical race was decreed. Werner Marti (SUI) won with 300 points, followed by Anton Palzer (GER) with 235 points and Robert Antonioli (ITA) with 185 points. Among Women, Victoria Kreuzer (SUI) got the victory with 280 points and after her there are the Spanish Nahia Quincoces Altuna with 191 points and the French Axelle Gachet Mollaret with 180 points. Turning to the Espoirs, the Italian Davide Magnini triumphed with 250 points, ahead of the Belgian Maximilien Drion Du Chapois with 220 points and the French Samuel Equy with 200 points. Italian success also among Women with Giulia Murada with 300 points against the 190 points of the Swiss Alessandra Schmid and the 145 points of the teammate Ilaria Veronese. At the end, among Juniors, the victory of the Specialty Cup for Vertical went to Sebastien Guichardaz (ITA) with 280 points, followed by the Swiss Aurélien Gay with 260 points and his compatriot Florian Ulrich with 146 points. Among the Women equal in age, the Russian Ekaterina Osichkina triumphed with 300 points, while the Swiss Emilie Farquet got the second position with 210 points and the French Malaurie Mattana the third with 180 points. For the finals of the Madonna di Campiglio World Cup tomorrow there will be a rest day with a view to the last act scheduled for Saturday morning with the Individual race, that will decree the crystal cups. The official award ceremonies of the Sprint and Vertical races will be held on Friday 5th April at 5.30 pm in “Piazza Sissi”, as well as the delivery of the top 5 bibs for the Individual race.